Topics: Lost Or Stolen Passport, New/renewal-british Passport, and Renewal Brazilian Passport. 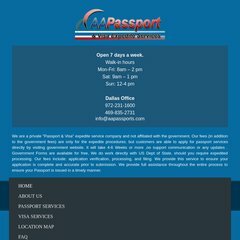 aapassports.com One stop passport And visa expedite services, US Passports .. The estimated 51 daily visitors, each view 1.40 pages on average. samedaypassportandvisa.. One stop passport And visa expedite services, US Passports, passport, ..
samedaypassport-visa.c.. One stop passport And visa expedite services, US Passports, passport, ..
Its IP Number is 69.163.177.217. It has 3 DNS records, ns3.dreamhost.com, ns1.dreamhost.com, and ns2.dreamhost.com. American Registry For Internet Numbers (Virginia, Chantilly) is the location of the Apache server. PING www. (69.163.177.217) 56(84) bytes of data.